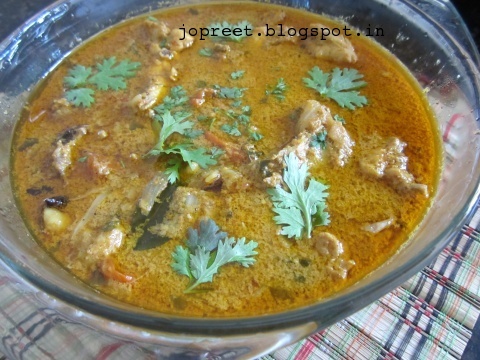 Chicken & Coconut Milk Curry, a spicy yet rich and aromatic chicken curry made using pressure cooker. Marinated chicken is cooked with fresh ground masala and coconut milk, and the coconut oil brings out the nutty flavor. This curry can be enjoyed with rice or roti or appam or idiyappam. Marinate chicken with turmeric powder, curd and keep aside for 10 mins. Heat a pan or wok and dry roast peppercorns, dry red chillies, cumin seeds and fennel seeds for a while till nice aroma comes. Remove from the heat and allow to cool. Grind it in a mixer to coarse powder. Do not add water. Keep masala aside. Prepare coconut milk and keep it aside. Heat coconut oil in a pressure cooker and temper mustard seeds. Add chopped onions and nutmeg powder if using. Fry for a min on low flame. Add ginger-garlic paste. Saute a while and add chopped tomatoes. Mash the tomato pulp. Add chilli powder, garam masala and ground masala powder. Mix well everything. Add marinated chicken and coconut milk. Mix well and add 1 cup water. Garnish with kasoori methi if using. Add salt to taste and close the lid. Pressure cook for 8-9 whistles and remove from the heat. Serve hot with rice, roti, parotta, appam or idiyappam.